Arteast Ottawa: AOE Announcement; Spring Mix; Members' Announcement; etc. AOE Announcement; Spring Mix; Members' Announcement; etc. 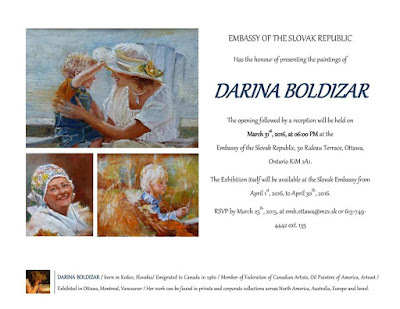 Darina Boldizar has been invited by the Slovak Embassy to show her artwork. It will be a retrospective exhibition of my paintings spanning the last decade. The opening on March 31, 2016, at 6:00PM. OTTAWA – To mark the International Women's Day, the European Union National Institutes for Culture (EUNIC) is inviting you to an evening of Music by European Women Composers on Saturday 19 March. The concert is organized in partnership with the European Union Delegation to Canada and the Embassies of Austria, Bulgaria, Ireland, the Netherlands, Poland, Portugal, Romania, Slovakia and Spain. Date: Saturday, March 19, 2016 at 7 p.m.